The special events are run in addition to our regularly scheduled raft trips we offer at each of our three locations. For information pertaining specifically to rafting, please refer to the “Raft Trips” page. * Please note: All activities have a minimum number of participants needed to be run. In the event an activity is canceled due to low enrollment or extemely inclement weather, all fees will be refunded. Enjoy a trip through the gorge and help out a local Food Pantry at the same time. For every dollar's worth of peanut butter, jelly, and / or marshmallow fluff you bring to our Site Office the day of the trip, we will take that amount off the total cost of your trip. It’s a win/win situation! Paddling through the gorge at night is an experience like no other. The full moon will provide ample light for us to safely navigate our rafts from Lee's Landing to Helena and there will be a guide in every raft to reassure you along the way. We'll even stop along the way to toast some marshmallows and have a cup of cocoa! Space is limited to 25 participants. Cost: $55.00 per person. Advanced reservations required. This weekend-long event is a chance for you single moms to build some lasting memories with your kids. Besides all the neat outdoorsy stuff you'll be doing like paddling a raft and splashing in the river, you and kids can swim in an indoor heated pool, cook s'mores around a campfire, and enjoy the juggling genius of Nels Ross of "In Jest", etc., and mom will find some much needed refreshment for her soul. The picturesque campus of Houghton College will be our home for three days and two nights. We’ll have access to the cafeteria, dorms, athletic facilities with supervision, and chapel. The highlight of the weekend will be the Saturday evening program. Our featured speaker is Natalie Thomas from the Family Life Network. She’s a "been there - done that" mom who uses her gift of humor and Southern Belle charm in her unique story telling. Child care will be provided so mom can sit back, relax, and be filled with the Lord’s love and grace. Cost: Tiered Pricing - Mom & 1 Child - $125.00, Mom & 2 Children - $190.00, Mom & 3 Children - $225.00, includes all activities (subject to change as needed), lodging, meals, and programs. Additional children or adults: call for pricing. This event fills up fast so don't hesitate! For more information, check out: MomAndMeRetreat.com. To register, contact Joan Anderson at: 716.341.7657 or e-mail: mom.me2009@gmail.com. Thanks to the fine folks at YMCA Camp Weona, we've brought back one of our most popular special events. Your day starts at Camp Weona with a basic lesson in horsemanship and then two members of their equestrian team will lead you and your fellow riders on an hour long trail that winds through the beautiful wooded countryside. From there you'll head to our Rafting Office at Letchworth State Park for a catered picnic lunch and then you'll get ready to join up with the rest of the 2:00 pm raft trip for a 5 mile paddle trip through the gorge. Space is limited to 10 participants. Cost: $85.00 per person, includes both activities and lunch. Advanced reservations required (minimum age – 12 years old). Come spend the day with us as we explore the park from our unique perspective. You will be accompanied by several members of our guide staff that are very well versed in the history of Letchworth State Park as well as the ecology and geology of the local area. We'll paddle through the deepest part of the gorge then upon reaching the takeout at St. Helena a catered lunch will be served. After lunch we'll take a leisurely stroll along the most scenic section of Trail #1 at the South end of the park. Space is limited to 20 participants. Cost: $75.00 per person, includes all group gear, guides, and lunch. Advanced reservations required. Now it's Dad's turn to be treated to rafting. The same deal as Mother's Day applies. 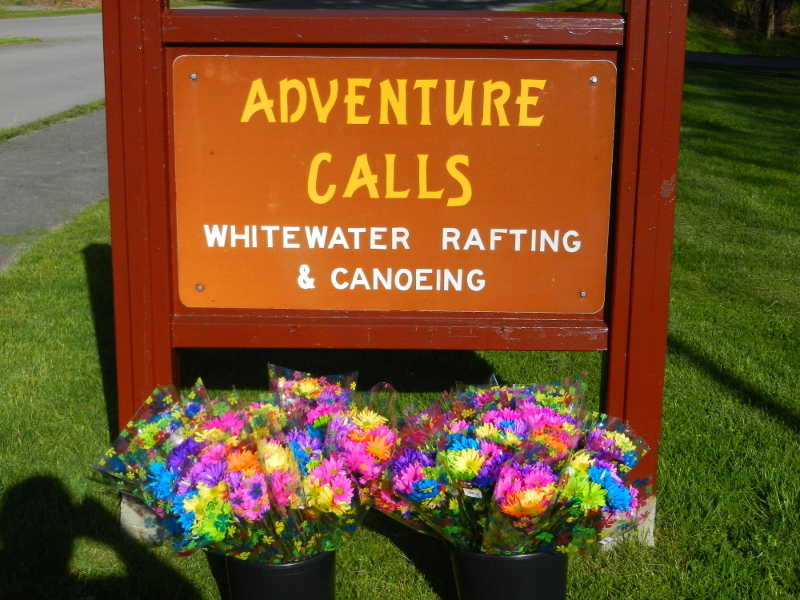 Since we weren't sure what his reaction to flowers would be, upon returning to the rafting office after the trip, Dad is given a special gift he’s more likely to appreciate. Looking for a little excitement in your life? Paddling one of our inflatable sit on top kayaks will certainly meet that need. These little boats are much more responsive than a raft and class III whitewater is a lot bigger when it's at eye level!. Don't worry though, "duckies" are pretty stable and relatively easy to paddle, besides, our licensed guides will be on the trip as well, just in case. Cost: $60.00 per person. Participants must be at least 12 years of age. You don't have to be an expert to survive spending a night in the woods. Come learn about things like; trip planning, shelter building, fire building, first aid, CPR, finding food and water AND have fun while you're at it. $200 per person; meals and camping fees included. Advanced reservations required. Who's up for a day long test of physical endurance and mental stamina? Our day begins at the Lower Falls Parking Lot (8:00 am). The course will consist of; 1.) a 3.1 miles run from there to the rafting company launch site on the East side of the park. 2.) a 5 mile river paddle using inflatble sit on top kayaks (boats and equipment provided) to the St. Helena river take out. 3.) a 4.5 mile run back to the Lower Falls Parking Lot. 4.) a 25 mile biking loop from the parking lot to the Mt. Morris dam overlook parking lot to the new Upper Falls railroad bridge parking , then returning to Lower Falls Parking Lot. A chicken barbecue will be served after the challenge has been completed. Cost: $100 per person. Advanced registration required.